Angels for Mexico is a nonprofit organization which was created to provide equipment and supplies to firefighters and paramedics in Mexico where they would normally not have all the neccessary equipment to do their job. Since 2007, having participated in many projects in Mexico, Angels for Mexico noticed that the children in the areas they were helping often did not have access to playgrounds or safe and fun activities. 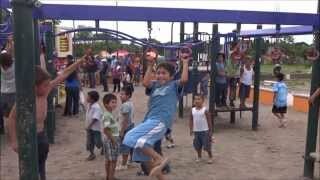 Emmanuel Foundation worked with Angels for Mexico on a recent playground project that was completed in September of 2013 in Puerto Vallarta. A playground was being decomissioned and taken out of a school in Alberta and instead of sending it to the landfill, the playgound was donated so that children in Mexico could have a playground as well. Angels for Mexico had the relationships and contacts with the people in the Puerto Vallarta, as well as volunteers who were eager to go and help build the playground. Emmanuel Foundation had the ability to refurbish, ship and oversee the construction of the playground. Together, the organizations were able to complete construction of the playground which now gives hundreds of children access to safe and fun equipment every day.